Sydney has had its fair share of rain recently, which has boded well for the Nomad as Duncan comes in and works on rainy weekends. A lot has transpired since the last article which has put a huge smile on my face. The rear cargo area is now complete, with the carpet laid and the seatbelts fully sorted. 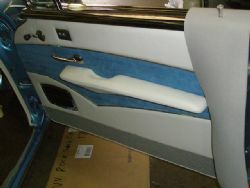 The rear chrome accent trim is installed and adds a bit of bling to the simplistic carpet. Carpet has been laid on the floors, side panels and the bottom of the door trims and the colour and texture compliment the leather superbly. 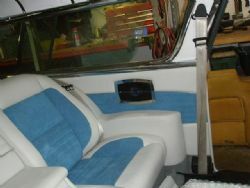 The rear seat area is all finished and the speaker grills are installed. The chrome strips that run through the trim marry up nicely with the line in the speaker grills and make it look classy without being over done. The steering wheel has been stitched up and installed in light grey leather and it feels good to the touch and also looks the goods. The potential drama with the kick panels has been overcome with a simple solution of the good old bendy ply. Once fabricated, these were covered in carpet and can be easily removed for access to the computer and fuses. 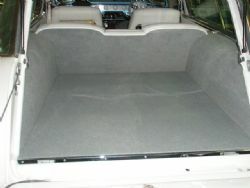 All the panels around the bottom of the rear seat have been made and carpeted. After much deliberation we decided to jettison the front console as it would have been near impossible to get out once installed. It is critical that everything going in can be easily taken out should the need arise. There was also a clearance issue for the air conditioning ducts so Duncan has built a new front piece that overcomes all the problems and can be removed easily. The rear view night/day mirror has been massaged and mounted. I had an issue with a supplier over the mounting bracket but this has been overcome so another requirement for rego has been sorted. The front door trims have been completed and installed and really set the interior off well. Using a similar design theme from the rear Duncan’s off sider Dave has nailed the design and with the chrome upper strip and handles installed the panels look and function superbly. Once the leather arrives it should only take a few days of sewing and the interior will be done. 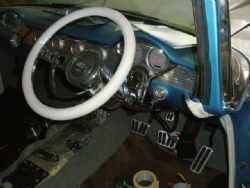 Seat pockets, cover the console and sun visors and install the stereo head unit, air conditioning controls and alarm light and were done. Yeehaa.